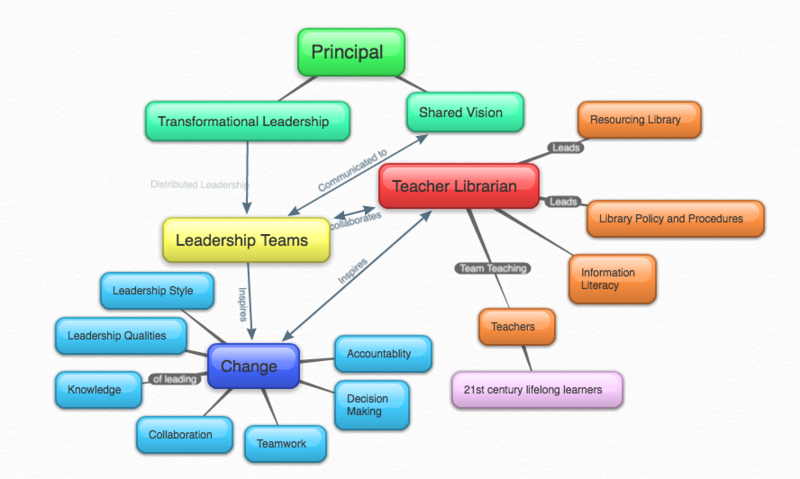 Not only did the creation of a Leadership Concept Map in ETL504 (Ellis, 2015) teach me the benefits of mind-mapping using a digital tool but it enabled me to examine the multifaceted layer of middle-management in which an experienced TL is ensconced, as being central to the resourcing, teaching of research skills and policy development in primary schools. Promoting your school library (Australian Library and Information Association, 2013) summarises the diverse roles of a TL which includes being: an information services manager, a curriculum leader, an instructional partner, a budget manager, a Website manager and an IL leader (Herring, 2007). The most important of these to students is the teaching role of the TL, combined with the educational and leadership role of resourcing the curriculum to assist classroom teachers and students with quality print and digital rich resources, supporting their teaching and learning program. Developed the leadership skills of my Library Monitors by introducing a Book Week competition and in collaboration with them created a What is Bookweek?PowerPoint presentation which showcased at various assemblies and Parent and Friends School events. Book Week had not previously been promoted (listen to Josh P below). Provided quality print and digital resources to the History and Geography team including uploading eBooks and interactive resources on all computers for student and teacher access. There is still so much to be achieved! Last year, my Principal wanted me to concentrate on the physical layout of the Learning Centre, which I accomplished. Now, I need to start critically evaluating and creating library policy, procedures and documentation. This year we have been experimenting with teacher borrowing procedures as the highest overall loss documented at last year’s stocktake was TR at 41%. It will be interesting to note if having moved TR into a strongroom with access only while either TL is in the LC and having class teachers borrow resources via the TLs rather than by themselves, will make a difference. As part of ETL523, I designed and implemented my first SurveyMonkey which gave me hard evidence and supported changes I wished to propose to the Principal. I need to work on evaluating changes and this has shown me one way in which it can be done. In the future a school collection policy based on the fictitious Book Nook Collection Policy for ETL503 (as I wasn’t TL in a school) needs to be established and feedback from the ETL523 Environmental Scan which has been submitted to the Principal will need to be actioned. One leadership area I will need to work on is working in a team to develop procedures and policies because while I theoretically understand the importance of documentation, often struggle to actually complete. I also need to work on expanding and creating a Personal Learning Network. I have already seen the advantages in joining a Yammer group to help solve technological issues with Skype and further develop my learning and teaching practice. I’m part of the NSW TL listserv, ALIA, specific Twitter groups and the Digital Citizen Facebook page – just a beginning!